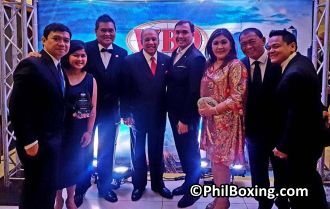 PANAMA CITY, Panama -- The Filipino delegation lead by GAB Chairman Abraham "Baham" Mitra achieved a total success in its participation in the 31st WBO Convention that took place from October 29 to November 2 here in the beautiful Latin American nation of Panama. 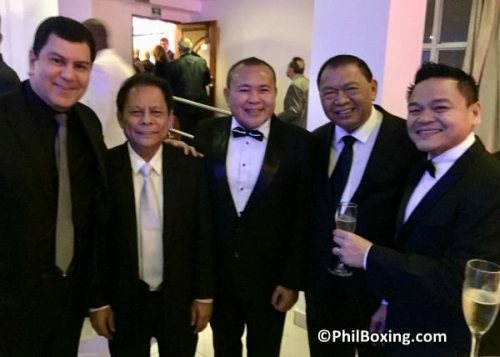 The Filipino delegation was formed by star boxing promoters Johnny Elorde and his wife Liza Elorde, Cagayan de Oro promoter Kenneth Rontal and his wife Aime; and GAB ring officials Danrex Tapdasan, Edward Ligas and Carlos Costa. Chairman Mitra addressed a variety of important points, including the controversial decision in the Pacquiao-Horn WBO world title fight in which referee Mark Nelson allowed boxer Jeff Horn to get away with uncountable fouls that in the view of a number of experts and fans might have affected the outcome of the rumble that took place in July of last year in Brisbane, Australia; a clash in which the Manny Pacquiao lost its WBO Welterweight title. In addition, Mitral worked on better and closer relations with the WBO for the benefit for Pinoy fighters and the Filipino boxing community. He held talks with leaders of the organization, including president Varcarcel, vice president Leon Panoncillo and other executives of the important boxing organization with headquarters in San Juan, Puerto Rico. Meanwhile, the Elorde family worked on the ratings of Filipino boxers and even better relations with the sanctioning body presided by attorney Francisco "Paco" Varcarcel of Puerto Rico. Top photo (L-R): Promoter Kenneth Rontal and wife Amabelle, WBO vice-president Leon Panoncillo Jr., WBO president Francisco Valcarcel, GAB chairman Abraham Mitra, Liza Elorde, Johnny Elorde and Referee Danrex Tapdasan. L-R: Carlos Costa, Dong Secuya, Edward Ligas, Johnny Elorde and Danrex Tapdasan. Also, promoter Kenneth Rontal represented his star boxer WBO Minimumweight World Champion Vic Saludar, one of the reigning Filipino boxing world champions. Meanwhile, GAB judges Danrex Tapdasan, Edward Ligas and Carlos Costa spent their time attending seminars, workshops and lectures for ring officials. They participated in discussions on scoring and ethics and took examinations. Filipino journalist Dong Secuya, the creator of this web site Philboxing.com attended different events of the WBO Convention, reporting on details of the important event which next year will take place in Tokyo, Japan. Secuya reported on a wide number of issues including the breaking news of the WBO approval of the super flyweight world title fight between Filipino Donnie Nietes and Japanese Kazuto Ioka for December 31 in Macao. The Filipino delegation shared views with WBO president Francisco Varcarcel, visited the famous Panama Canal, got to talk with Panama boxing legend "Hands of Stone" Roberto Duran and enjoyed the hospitality and fraternity of the WBO and the friendly people of Panama.